The newest addition to the Star Wars franchise, Solo: A Star Wars Story, has received a lot of hate on the Internet in recent months over the lead actor playing Han Solo not sounding or acting like Harrison Ford's Han Solo at all. While this seems like a big issue for many fans, it turns out it was not the biggest concern for director Ron Howard. While the trailers and promotions are actually starting to look good for the upcoming spin-off, seemingly vanquishing all worries that the final product will be bad, the acting of star Alden Ehrenreich has still been a major concern for Star Wars fans. The character he has been seen playing in the trailers may seem like a fun and relatable character, but many people are having trouble seeing him as a young Han Solo. He may look like Han, but to many fans, he does not act or talk like the intergalactic smuggler. Ron Howard, who took over as director for Solo last summer, recently spoke up about this complaint. In his interview with Empire magazine, Howard revealed that the neither he nor Ehrenreich intended for this version of Han Solo to be an impersonation of Harrison Ford. Here is what Howard had to say. "It was always clear from the beginning, before I was involved, that it was not going to be an impression of Harrison. No one wanted that. Part of Han Solo's character is sort of a vibe and a feel and a body language." While this direction may be hard for many fans to look past, we are optimistic that it will increase the quality of the film. Rather than focusing on repeating what Harrison Ford had done with the character in the past, they are now currently focused on expanding upon the character, which is probably a lot better. Something else we need to consider is the approximate 15 year gap between the events of Solo: A Star Wars Story and Star Wars: A New Hope. It is understandable that Han Solo's demeanor would change between his early-20s and his mid-30s. His voice would certainly be one of the things about Solo that change, as many men have their voice become more deep and growly during this point in their lives. Hearing the voice of a mid-30s Harrison Ford coming from a early-20s character would just feel unnatural, which is likely part of the reason why Lucasfilm chose to make this decision for Alden Ehrenreich's character. While fans were worried about the quality of Solo: A Star Wars Story, the latest trailer has brought the hopes of many people back up. This revelation from Ron Howard to Empire Magazine is also a glimmer of hope for many Star Wars fans whose main concern was how Ehrenreich's Han Solo turned out. 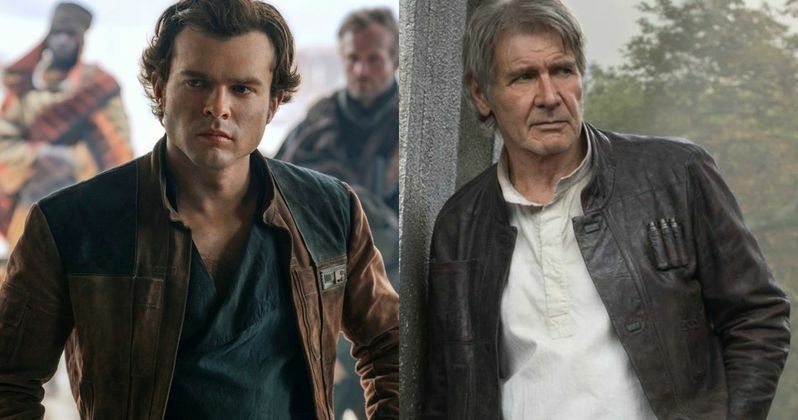 Though Ehrenreich isn't doing an impersonation of Harrison Ford, based on Howard's comments, his character will still be very similar with the same heart. Regardless, we will see how well Ehrenreich's adaptation of Han Solo pans out next month when Solo: A Star Wars Story hits theaters.